Editor/Author Bauce, Karen and Fitzpatrick, Joyce J. 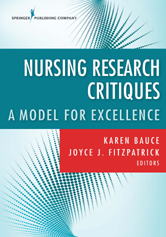 This is the first resource to provide APRN students and practicing clinicians with a step-by-step guide to critically analyze evidence from research studies. As part of a profession that relies on best evidence, nurses need to be able to effectively assess research articles. Equipped with these skills, nurses will lead an informed practice and improve patient care. Introduction - Bauce Karen and Fitzpatrick Joyce J. 2. Cultural Competence and Psychological Empowerment Among Acute Care Nurses - Critique: Ea Emerson E. and Gilles Salena A. 7. Impact of Health Care Information Technology on Nursing Practice - Critique: Madigan Elizabeth A. 9. Resilience and Professional Quality of Life Among Military Health Care Providers - Critique: Reimer Andrew P.
10. Evaluation of a Meditation Intervention to Reduce the Effects of Stressors Associated With Compassion Fatigue Among Nurses - Critique: Rhoads Jacqueline and Fitzpatrick Joyce J. 12. Hypertensive Black Men's Perceptions of a Nurse Protocol for Medication Self-Administration - Critique: Fahs Deborah B. 13. Primary Care Experiences of People Who Live With Chronic Pain and Receive Opioids to Manage Pain: A Qualitative Methodology - Critique: Marchi Nadine M.
14. Older Adults’ Perceptions of Using iPads for Improving Fruit and Vegetable Intake: An Exploratory Study - Critique: Perazzo Joseph D.
15. Summary and Future Directions - Fitzpatrick Joyce J.